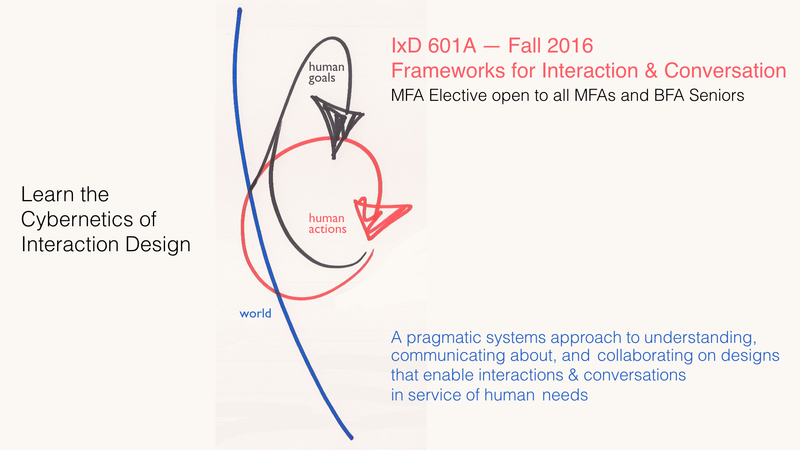 In the Fall 2016 Semester, CCS MFA Interaction Design is introducing a new elective, Frameworks for Interaction and Conversation. It’s an in-depth course that explores cybernetic models of effective action that apply to design of software, services, products, entertainment, or organizations. The models allow designers to make the needs of human beings more explicit as they understand what is possible and negotiate what is desirable. The models also facilitate collaboration among all the members of the design team. As a result, employing cybernetic models can make any design process more productive and make design outcomes more effective. The models combine into frameworks that express the rich inter-relationships between human beings and interactive contexts and artifacts. Students will study the models and frameworks and thereby gain a powerful foundation of “systems literacy”. There are many deep connections between cybernetics and design and computing and the importance of cybernetics and conversation in the design process is foundational. If you are a CCS BFA senior or MFA student, contact Paul Pangaro, Chair of MFA Interaction Design for further information.